A historical monument damaged beyond repair in an accident last year has been replaced. 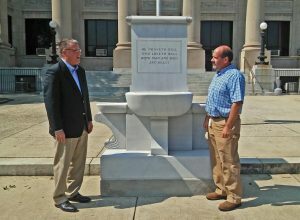 In June 2015, contractors were doing weekend maintenance work to the exterior of the old section of the Johnston County Courthouse when the operator of a heavy equipment lift accidentally bumped into the marble fountain that was erected as a war memorial in 1923, just two years after the courthouse opened in 1921. The memorial was shattered into several pieces – large and small. The contractor took responsibility for the damage and initially tried to have it repaired. When that failed, the pieces were shipped to a company that used a laser to map every inch of the marble and then recreate the 92 year-old monument by hand using stone shipped in from Montana. The new pre-constructed fountain was recently shipped in and installed. Instead of being just a few feet off Market Street, the new fountain now sits about 10 feet off the roadway for safety purposes. Johnston County Facilities Superintendent Daniel Clifton closely monitored the repair process and the reinstallation. County Manager Rick Hester said many people had asked when the monument would be returned. The new monument is more structurally sound that the one it replaced. The contractors insurance company picked up the $54,254 bill for the new monument. There was no dedication or fanfare when the replacement monument was installed recently, unlike the original one in September 3, 1923 when local dignitaries gathered for the unveiling, including speeches and a barbecue where the entire town was invited to attend.